Billionaire engineer and entrepreneur Elon Musk in 2012 made his call for a rapid land transportation that had never been done before — what he called a fifth mode of transportation or Hyperloop that would allow man and cargo to travel at speeds of 700 mph. COURTESY North Las Vegas is the test site for billionaire engineer and entrepreneur Elon Musk's Hyperloop project. COURTESY Construction is under way on what’s called a Dev Loop — a completed integrated system in which capsules travel in tubes. It is expected to be completed in January. COURTESY Contractors have started pouring foundations for the construction of columns for a straight-line development loop extending more than 4.6 miles adjacent to Apex on federal land leased for 30 years by the Bureau of Land Management. When President John Kennedy in 1961 called for the United States to place a man on the moon by the end of the decade, engineers met the challenge even though no one knew at the time how to accomplish it. Billionaire engineer and entrepreneur Elon Musk in 2012 made his call for a rapid land transportation that had never been done before — what he called a fifth mode of transportation or Hyperloop that would allow man and cargo to travel at speeds of 700 mph. He referred to it as a cross between a Concorde, rail-gun and air-hockey table, and Las Vegas would eventually be the focal point for that experiment becoming a commercial reality within the next three to five years. The world got a chance in May to see an open-air test of the technology at the Apex industrial park in North Las Vegas. Construction is under way on what’s called a Dev Loop — a completed integrated system in which capsules travel in tubes. Contractors have started pouring foundations for the construction of columns for a straight-line development loop extending more than 4.6 miles adjacent to Apex on federal land leased for 30 years by the Bureau of Land Management. Construction is expected to be completed in January, and that will allow testing to begin, said Brian Gaumer, vice president of test and development engineering. The Dev Loop brings it from a lab scale experiment (in Los Angeles) to full size, Gaumer said. It will be nearly a full-sized pod in a tube, levitating and moving at various speeds and used to integrate all of the systems, he added. Musk is already behind the development of electric cars in Nevada with Tesla and his company SpaceX is propelling cargo for the International Space Station for NASA. Gaumer, who’s based in Los Angeles, has oversight for the test facility in North Las Vegas. While it’s a challenge as an engineer to work on a project that’s never been done before, Gaumer said it’s exciting to be on the cutting edge of technology and being able to contribute to an upgrade in man’s existing transportation system. The good news about the challenge is a lot of the technology Hyperloop is working with what exists in one form or another, Gaumer said. And it helps to work with some of the best engineers in the world, those who’ve worked for Boeing, Airbus and Caterpillar, Gaumer said. Hyperloop needed a test site where the land was flat and there wasn’t a lot of people. Southern Nevada and Apex specifically fit that bill. It also needed a local government and state government to work with and make the project happen on a quick timeline, Gaumer said. Hyperloop has gotten $9.2 million in economic incentives from the state that includes sales, business and property-tax abatements. In return, the company is investing more than $121 million in equipment and facilities and creating high-wage jobs. What Southern Nevada had going for it that helped catapult it over the competition were construction companies and design contractors, Gaumer said. Hyperloop uses Dimick Development Co. and Whiting-Turner as its contractors and Poggemeyer Design Group. There are about 30 construction workers on-site now. 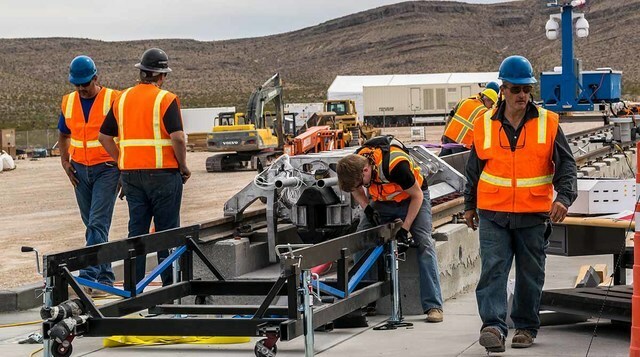 In addition to its 13-acre test facility at Apex and the adjacent BLM land, Hyperloop has a 100,000-square-foot metal works manufacturing facility in North Las Vegas. Workers are already cutting parts, he said. Hyperloop will continue to use its open-air test site for propulsion design controls and tests not done in the development loop, Gaumer said. The plan calls for permanent facilities at Apex, including an office. Between the Apex site and metal works, Hyperloop has 30 employees in Las Vegas at this time and another 40 to 50 people are expected to be brought to the metal works site within the next year-plus and another 50 to 75 brought into Apex over time, Gaumer said. In its state application, Hyperloop said that it would have 214 jobs over 10 years with $113.5 million in payroll. There’s a lot of interest from around the world for Hyperloop, but no decision has been made where to implement it, Gaumer said. It can be above ground, underground or even under water. “We have a Hyperloop global challenge right now, which is a competition to fund the most promising place to put this,” Gaumer said. Hyperloop spokesman Eric Nielsen said there have been more than 900 applications from around the world with more expected. For now, Las Vegas is the center for Hyperloop and it’s expected to remain a development center since the system may not look exactly the same and require variations on pods and propulsion, Gaumer said. 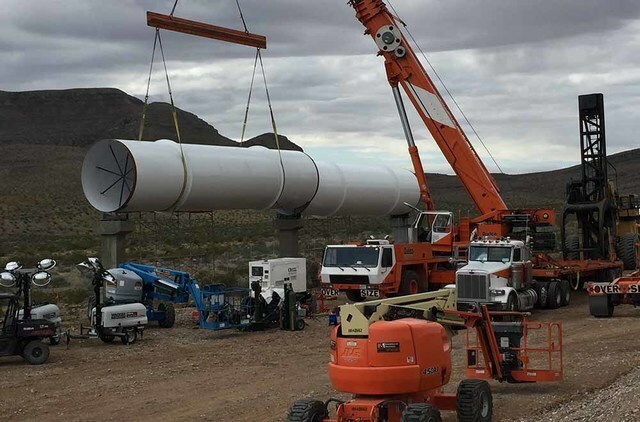 Gaumer said it’s probably not realistic to build the tubes in Las Vegas and ship it off to Dubai, Finland or some other locale when the route may be more than 1,000 kilometers. That wouldn’t be feasible and would likely be done at a manufacturing center in that country, he said. Gaumer calls it the smart technology versus the dumb technology, and the smart technology will be built where it makes sense cost-wise and where there’s an available workforce, he said. “Things are moving forward as we have been planning, and we’re not seeing any big barriers that have cropped up. The time that we have had in Las Vegas has been fantastic. We appreciate what the state and community has been doing for us,” Nielsen said. The company has been a curiosity for Southern Nevada residents who’ve enjoyed the national press attention the propulsion test received in May. Gaumer said he’s even fielded a lot of questions about the project, including people trying to understand how it works and whether it’s dangerous or not. There’s a misnomer about how people will be able to handle the acceleration up to 600 to 700 mph and what it feels like to stop, he said.